It’s easy to feel like you don’t owe your employees anything. After all, you’re providing them with a job and paying them for their service. But when you think about all of the time, effort, and emotional energy that they pour into your company, you’ll realize that you may need to adopt a more appreciative posture. You have an intrinsic understanding that motivated employees are more effective and productive than disengaged employees. Despite this, you don’t spend a whole lot of time thinking about employee recognition – which is one of the underlying forces and contributing factors involved in motivating your workers. Most employees fail to pay attention to employee recognition because they assume it requires too much time, energy, and money, but this isn’t always the case. In other words, recognition is easy and drives tangible and positive results. So what’s holding you back? If you’re like most business owners or managers, you don’t know where to start. That’s why we’re providing you with a few practical ideas to get the wheels turning. Food talks. 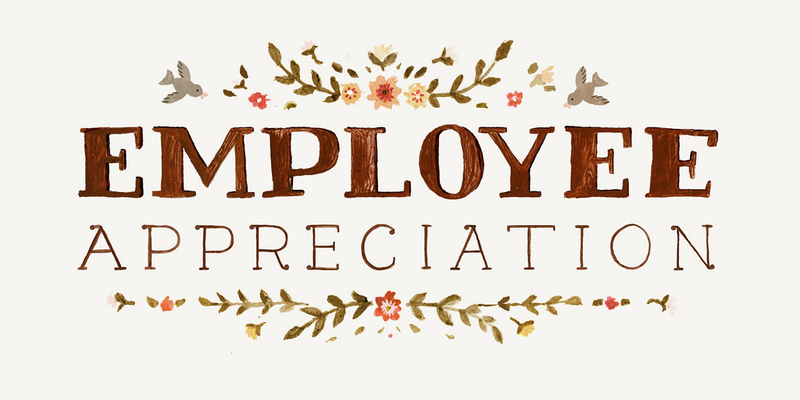 If you want to show your employees that you appreciate them, surprise them with a catered meal. This little expression of gratitude is something they’ll remember long after their stomachs are full. There’s something about receiving a tangible expression or recognition that makes employees feel special. When employees reach certain milestones – such as multiple years of service, successfully completing a project, etc. – consider giving personalized employee gift plaques that can be placed in their office or cubicle. While it’s been shown over and over again that money is not the best motivator, it’s certainly a good motivator. Offering bonuses can be a good way to recognize behavior, but make sure it’s directly tied to tangible results. Otherwise, a bonus is viewed as something to expect, rather than something that is earned. Sending a nice email with encouraging words is better than nothing, but email is a pretty impersonal medium. A handwritten note delivered to an employee’s desk, on the other hand, shows time, effort, and purpose. Try writing at least one handwritten note to an employee every single day. While handwritten notes are great, you probably don’t have the time to write dozens of them every day. In lieu of this, make sure you’re offering kind words on a daily basis. When you pass someone in the hallway, say a quick thank you for the project they just finished. When you’re in a meeting, acknowledge the hard work of the team members involved. When you see an employee who seems down in the gutter, pick them up with a compliment. Little things like this make a huge difference in your organization’s workplace culture. Asking for the input of your employees on key decisions is one of the subtlest and most natural ways to show your staff you appreciate them. At the end of the day, successfully motivating your employees can be honed down to one simple statement: put people first. When you put your employees first, recognizing them for their accomplishments, effort, and output becomes natural. Start with some of the ideas discussed in this article and then branch out to some personal ideas that fit your culture. You’ll always get a positive return on this investment.